Free Download Global Economic Prospects, January 2018: Broad-Based Upturn, But for How Long? The global economy is in a broad-based cyclical recovery. Investment, manufacturing and trade are on the rebound. Financing conditions are benign, monetary policies are generally accommodative, and the worst impacts of the recent commodity price collapse have begun to dissipate. However, the global economic outlook remains clouded by a number of risks. These include the possibility of financial market disruptions, rising protectionist sentiment, and heightened geopolitical tensions. Of particular concern is evidence of subdued productivity and slowing potential growth. 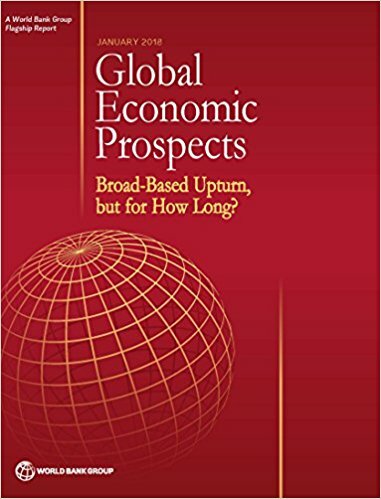 In addition to discussing global and regional economic developments and prospects, this edition of Global Economic Prospects includes a chapter on the causes of the broad-based slowing of potential growth and suggests remedies. The report also contains Special Focus sections on the impact of the 2014-2016 oil price collapse and the relationship between education demographics and global inequality. Global Economic Prospects is a World Bank Group Flagship Report that examines global economic developments and prospects, with a special focus on emerging market and developing countries, on a semiannual basis (in January and June). The January edition includes in-depth analyses of topical policy challenges faced by these economies, while the June edition contains shorter analytical pieces.